The problem is actually a problem of extreme homogeneity, and the question is how is possible that the universe is as homogeneous as is, and particulary how is possible that cosmic background radiation can be as homogeneous and isotropic, without recourse to random. 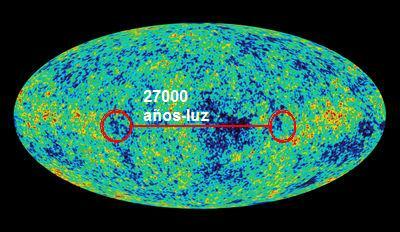 The assumption is that all points of the primordial universe were “tunned ” between them by means of electromagnetic radiation radiated by particles in the early universe, before to become transparent. The problem is called “of the horizon” in relation to the “observable horizon”. The point is that for our universe in which we measure the age of just under 14000 millions of years and we see galaxies in all directions at about 13500 million light years, the distance between two such galaxies in opposite ends of our observable horizon would be one respect the other at 27000 light years, outside of the observable horizon, ie is not possible to see each other between them as the light would take longer to get from one to another that the universe life so far. Just as the light, all electromagnetic radiation. They would not be connected causally. This is a problem depending on the pace of expansion of the universe, especially in the inertial expansion model, or model of the classical Big Bang(cosmological model of Einstein – De Sitter, with decelerated expansion by gravity), therefore it follows that in the past those points would not have been connected causally and it makes no sense to have the same characteristics. The model of “Cosmic inflation” (or inflationary theory) proposed by Guth and Andrei Linde,tries to solve the problem by assuming that initially the universe was connected “causally”, and that’s when the properties of the universe are leveled and matched (time of the grand unification). Then came the rapid “inflation” (to the 10-36 seconds after the big bang) or rapid expansion of space, with exponential growth in the rate of expansion, perhaps caused by alleged pressure by alleged space particles (inflatons) or by abnormally high cosmological constant, then slowing the pace of expansion and almost “freezing” the universe in such a situation of homogeneity which we observe now. The rate of expansion would be so high that the objects would move away so much and so fast that the would leave our “observable horizon” after having been homogenized, and so then at passage of time and re-entering these objects and regions of space in our observable universe, we see them with the same characteristics and same background radiation. But in the model classic of Big Bang, the initial expansion would be at a slower pace, simply inertial, so that with time and therefore the observable universe expanding, new portions of universe that would appear in front of our eyes shouldn’t have to be with the same characteristics as the nearby to us. There are estimates suggesting that radiation “informative” and equalizing should have gone even to 400 times the speed of light to get the current homogeneity (this is another explanatory hypothesis, the one of variable speed of light, higher in ancient times, Bekenstein and Joao Mägueijo). The model of exponential expansion as the inflationary, helps to explain the uniformity of the microwave background, but there are other models also usually neglected that permit this. One of them is the model of linear expansion, i.e. expanding steadily, in which can be found always a past time in what two galaxies are close enough to have been communicated with each other in the time between the Big Bang and this moment. On the other hand, If we consider the case of a universe neither open nor infinite, i.e., in a closed and finite universe, as the volume of one hypersfere, being small in size in their initial times, there was no problem of electromagnetic connectivity between all points and therefore no causality problems. The universe would be uniform because it had time to transmit and communicate between all points because they all are very near to each other in those initial moments. 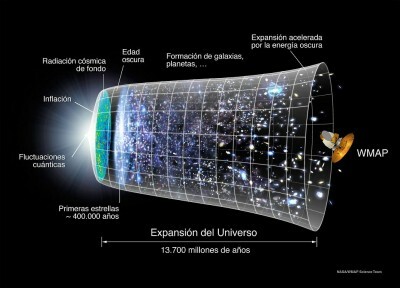 At least if it is the case of a initial expansion of the universe not very fast. Another cosmological model that solves the horizon problem is the one of cyclical or oscillating universe [arXiv:astro-ph/0612243v1], in which the Big Bang and Big Crunch occur cyclically. In this case, If we do not live in the first Big Bang, the previous Big Crunch could print the consistency observed in all the universe today.